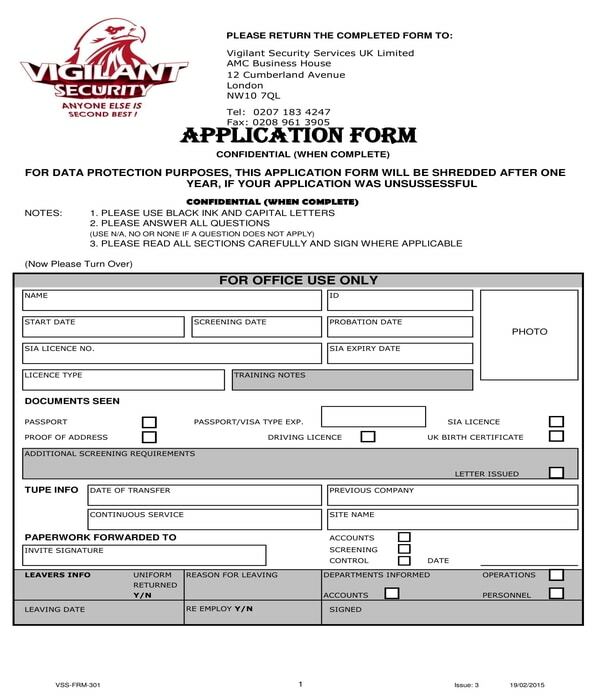 Security guard application forms are documents which are used for recording the information of applicants. 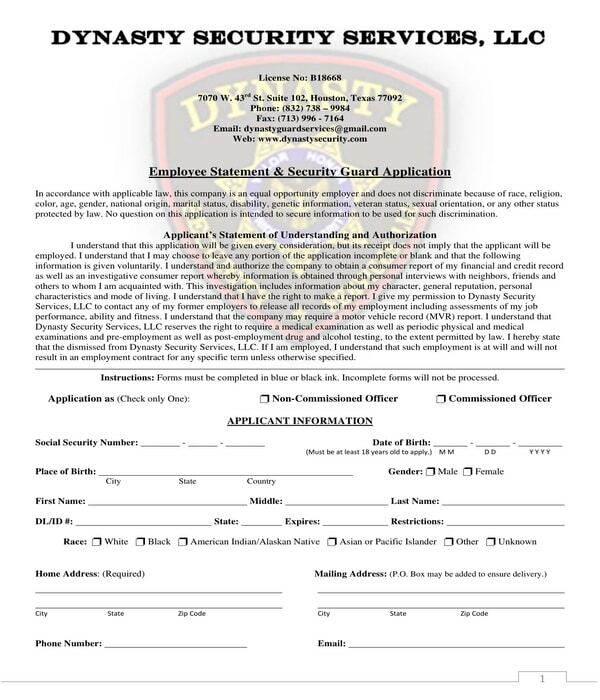 This form has two types that vary on who the user is, either a job applicant or an agency who plans to hire security guards for their establishment. If the form is intended to be used by a job applicant, then the form will be for collecting data to be used by the hiring manager or employer for the selection process of the company. On the other hand, if the form is to be used by an agency, then the basic information of the agency and the reason why a security guard is needed are some of the data to be stated in the form. Additionally, the security clearance and license certificates of the agency are also some of the information to be included in the form which will serve as a tool for the approval committee in determining the agency’s eligibility. 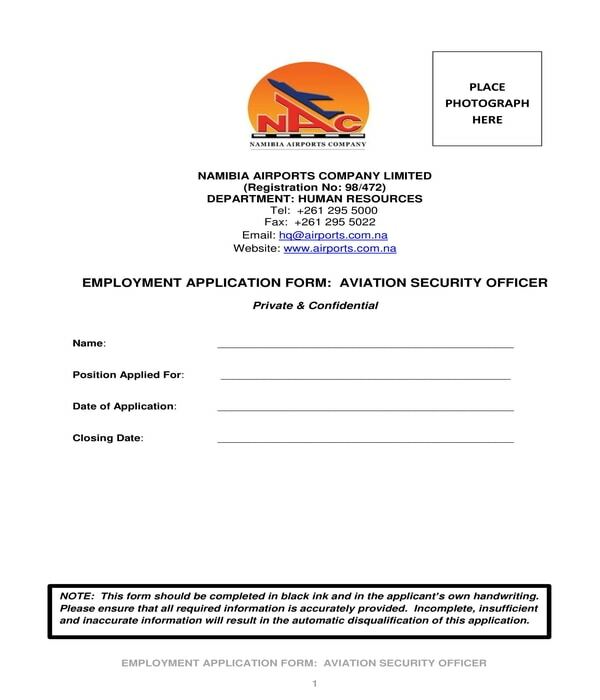 Aviation Security Officer Employment Application Form – This form is to be used by individuals who want to apply for an aviation security officer position. The first set of information to be disclosed by the applicant includes his name, the position that he is applying for, the date when he applied for the position, and the announced closing date of the application. Data protection and employment agreements are also defined in the form which must be signed by the applicant. In addition, a background or reference information section, and a page intended for the applicant’s pitch must be filled out as well to complete the application form. Employment Statement and Security Guard Application Form – There are nine sections in this form variety which must be completed by a job applicant. A statement of understanding and an authorization statement serves as the first section of the form which is then followed by an applicant information section to collect the applicant’s basic data. The second, third, and fourth sections are for the applicant’s employment and educational history, as well as the applicant’s character references. A general information section is the fifth part of the form while the sixth section contains a background questionnaire to be answered by the applicant. The succeeding sections will have the applicant’s signature for an affirmation statement, consent statement, and a uniform agreement. Security Guard Agency Licensure Application Form – Security agencies whose aim is to obtain a license certification are the users of this form variety. There is a section in the form intended to fill out by the licensing organization wherein the fees to be paid by the agency and their license number will be indicated. The agency’s information along with the details of their liability insurance and employment expertise are some of the data to be disclosed by the agency’s representative. Additionally, a notary certification section also needs to be completed by having a notary public affix his seal and signature to document that the disclosed information in the form had been verified to be true. 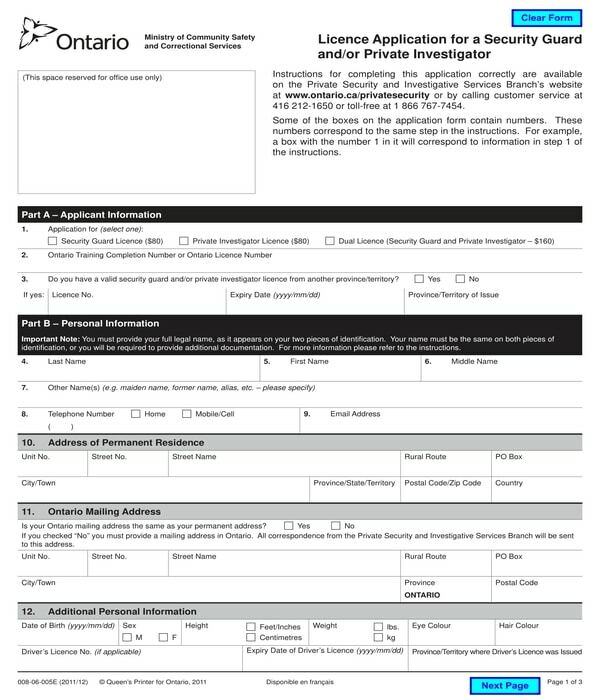 Security Guard Licence Application Form – This is another form to be used for license application, however, the user of the form is not a group or an agency, rather an individual who wants to obtain a license certificate for him to be acknowledged as a professionally licensed security guard. The form contains six parts labeled with letters. The first part of the form is the applicant information section wherein the type of license that the applicant wants to acquire will be indicated along with his license information. The second part of the form is the personal information section, the third part will have the guarantor’s information, while the fourth part discloses the criminal history of the applicant. A declaration and consent to the release of information statement are incorporated in the fifth part of the form. And lastly, the sixth part enlists the payments and requirements to be fulfilled by the applicant for the license application. Why Are Security Guard Application Forms Important for Employers? For background checking purposes: There are some job applicants who prefer not to disclose their educational and employment histories to their employers. Applicants do this to avoid having to explain the details of such histories and timeline which are questionable and can be a hindrance for their employment opportunities. However, with a security guard application form, an applicant will be required to disclose his history since there must not be any blank or an unanswered field in the form. In addition, there are also some pieces of data and information which are needed by employers to conduct a background verification check, and these will be included in the application form. To easily compare candidates: A company will be using one format and layout for their security guard application forms which promote uniformity in the collection of the applicant’s data. Because of this, an employer will be able to compare one applicant’s entry to another applicant and will allow the employer to easily select potentials, as well as weed out those who failed to meet the criteria of the company. To determine the willingness to comply with the company’s needs: The ability of an individual to comply with the rules and regulations of a company will first be tested in his willingness to complete the job application form and all other documents that the company requires him to fill out. If a job applicant is unwilling to use the form or yet skip sections in the form, then it will be up to the employer if he will consider the applicant for the position or not. 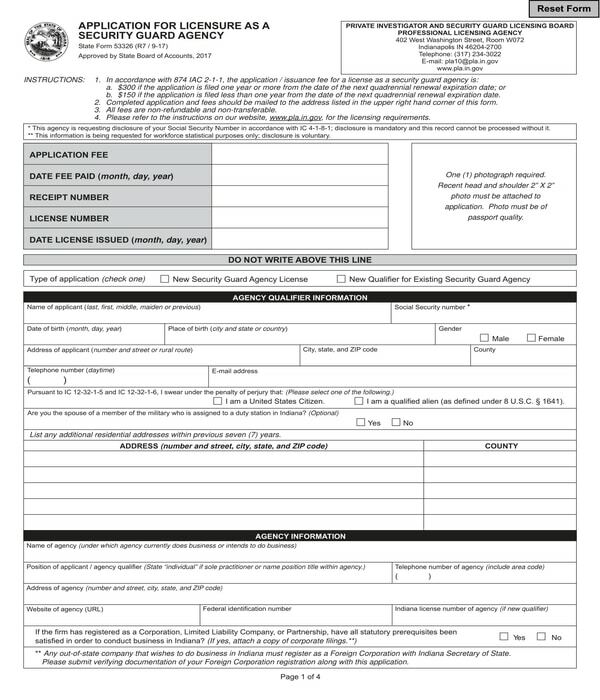 After applicants submit their completed security guard application forms, the receiving party must keep the form along with the applicant’s other documents. These can be used for reference, especially in determining the date when the application was approved, and when a security guard license will expire. Nevertheless, all varieties and types of security guard application forms hold the same weight of relevance, and with the same objective which is to document the information of any applicant.